Deep in the Sichuan province of central China, tucked in the miles of wilderness and hills that make up the area is the Jiuzhaigou natural reserve and the Huanglong Scenic valley. Both these sites are quite close to each other and offer diverse unique sites that are only comparable in how beautiful they are. Jiuzhaigou actually means “Nine Village Valley” and refers to the 9 Tibetan villages scattered through the region. The area is characterized by the rainbow of colours that appear throughout the landscape with lakes of crystal blue water; water so clear that from afar you can see everything at the bottom. There are many of these lakes and rivers and they transverse the land, snaking from river, to lake to waterfall forever feeding the vibrant vegetation. The trees turn from lush green in summer, going through the whole spectrum of red, orange and yellows in autumn, to finally turning white throughout winter as a layer of snow blankets the land. Just south in the same region the Huanglong National Parks can be found, housing a similar array of vegetation the Huanglong National doesn’t have quite the same number of lakes and rivers as Jiuzhaigou. More than making up for this is the very rare geological phenomenon that has inspired the local people hundreds of years. For miles through the valley winds golden hued calcium based over lapping pools that make their way down the hills. Huanglong actually refers to the tail of a golden dragon travelling the valley, a name obviously inspired by this remarkable geological happenstance. Short guide to exploring the Jiuzhai Valley in China: What should I do? The main attraction of the region and the main reason you would go is to visit the Jiuzhaigou national park. The national park is a UNESCO world heritage site and is very well looked after for this reason. 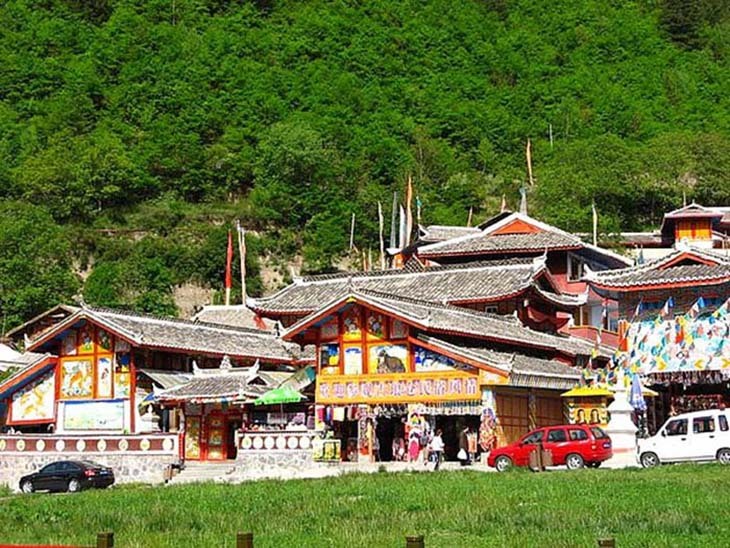 Unlike many other major natural tourist attractions around the world this park hasn’t been spoilt with garish buildings and much of the buildings in the actual park follow the architecture of 9 Tibetan tribes that originally inhabited the region. The most popular activity is to hike up around the mountains. The rivers and lakes look spectacular up close but from above the landscape is unforgettable. To enter the park is only a small fee and well worth it. There is a warning about climbing the mountains though, as people with breathing difficulties, the elderly and young children might be affected by altitude sickness. You can buy small tanks of oxygen for exuberant prices but for the most part healthy adults shouldn’t be adversely affected. The Huanglong national park travertines are the top attraction of this national park and really they are something you can’t see anywhere else in the world (the only other similar phenomenon would be the Pamakkale pool in Turkey but even they are different to these). The golden pools travel for miles and you need to be there to fully experience why it is known as the dragons tale and a place revered by Chinese emperors. The most picturesque views are had behind the Huanglong temple, a temple built to honour the dragon traditionally styled and complimenting the scenery. It is recommended to put aside a whole day to see this park as it takes a good half day on a bus if you are coming from Jiuzhaigo town. The best way to get to the area is by flying, the region is tucked away right in the middle of central China and most other forms of transport make the journey a huge trial. From Jiuzhaigou Huanglong airport one can take the train or a bus into Jiuzhaigou town, probably the best place to stay. Buses can be taken from Jiuzhaigou town to Huanglong but these can take up to three and a half hours, because of this it recommended to take a taxi if you’re short of time, taxis being relatively cheap in this part of the world. One really affordable and well placed hostel is the Angelie Hotel; they have dorms rooms which are very cheap but also have private rooms if that is your preference. They are situated only 500 meters from the entrance to the national park. They can be found in Pengfeng Village, Jiuzhaigou. Being so far inland and at such a high altitude the temperatures during the winter can go very, very low, conversely winter is becoming more popular because you don’t have to compete with as many other tourists and the white snow covering the land compliments the bright ice blue of the water. Typically spring and autumn are the optimum times, autumn is extremely popular as the leaves start to change colours the mix of red, and yellow and orange is dazzling. Summer is also recommended but it will get quite humid, as well as this the Huanglong pools will somewhat empty of water, not completely, but nowhere near their best.